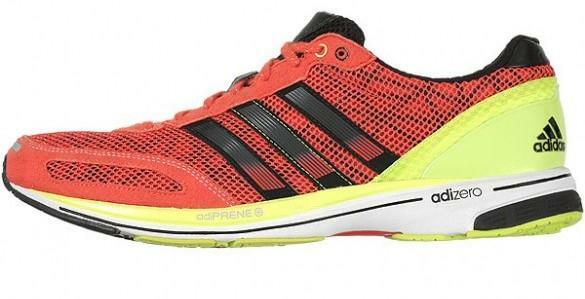 Today we welcome another guest reviewer, Caine Warburton to the Ultra168 ranks as he very generously pulled together some words for us on the Adidas Adizero Adios 2 running shoe. Caine, who’s a regular on the Queensland running scene, has put in some quality performances of late on the trails, and features on the podium of most of the races he enters.It’s worth noting too that we’re always on the lookout for people who’d like to submit reviews or some thoughts to us, as long as it fits with the general jist and flow of what Ultra168 is about, our doors are always open. So with that, we’ll leave Caine to tell you a little bit more about this shoe. The Adidas Adizero Adios 2 first came across my desk (and feet) on recommendation from Park Run Australia’s GM Tim Oberg. Being a minimalist ultra runner I was initially reserved about the Adios 2, mostly due to the hype that was created from its use by 2.03.38 world marathon record holder Patrick Makau. My preconceived idea was just because someone fast wears a shoe doesn’t necessarily mean that the shoe great. However as I opened the box and saw the shoe for the first time, felt the feather light weight and laced it up I knew my mind was about to be changed. Firstly the Adios 2 is light, very light and despite being marginally heavier than the original shoe it still only tips the scales at 221 grams. The adios has a slightly reduced heel to toe drop of 9mm compared to “typical” road shoes with 12mm. The initial fit of the shoe is great out of the box, it has a foot hugging upper and a basic, but effective lacing system. The lacing points are numerous on the Adios and this allows the shoe to be tightened effectively throughout the upper allowing a good fit for most people. The shoe has a “cockpit” style feel to it, being narrower through the mid foot and toe box making you’re feet feel like they have donned an aerodynamic rocket ship. That being said, runners with very wide feet may find some rubbing with this shoe, particularly around the mid foot. The Adios 2 is slightly stiffer than its predecessor, but the stiffness has more of a springy feel which adds a great deal to power transfer during hill work and faster efforts whilst aiding in the reduction plantaflexion fatigue which can occur over the longer distances. What about cushioning you may ask? Well the Adios 2 is designed as a racing shoe so you would expect that it would be relatively minimal in the cushioning department? This is not the case. The shoe has a good composition of light foam and rubber that means it’s reasonably forgiving for longer runs but remaining light and ready for race day. I have put over 100km in these shoes so far and being a minimal runner I personally use this shoe for long runs up to about 40km and tempo work on the road alike. I find this shoe really excels beyond expectations in the hills. I have done some serious hill climbing in this shoe and the power transfer and lightness are greatly enhanced. For the everyday runner, this shoe would make a great 5-21k race shoe and great for speed work (outside of spikes). I would however only recommend this shoe to quicker runners for the marathon distance (under 3.30hrs) as unless you are used to minimal shoes any longer could be a little bit unforgiving. So far 100km down, many wet runs and some demanding hills and descents later the shoe construction seems second to none. The shoe has not broken down and despite a slight compression in mid foot foam it feels just as good as it did on week one. The upper has maintained it’s shape and form, and there have been no issues with grip deterioration at this stage. In the end, performance is less about the shoe and more about the runner. 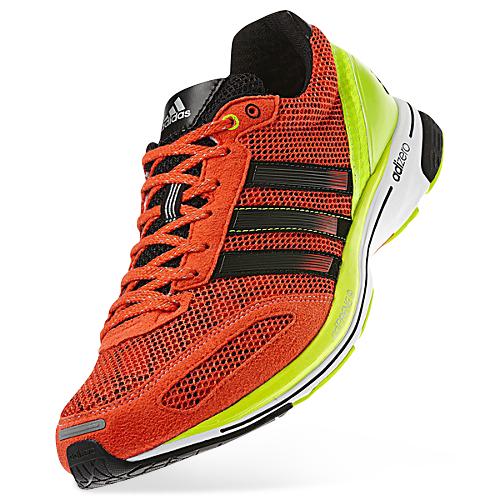 However if you are looking for a light as air performance race day shoe or are a minimal runner looking for a long distance racer/trainer I think you would struggle to go past the Adidas Adizero Adios 2 in your local running store. The “cockpit” fit and springy stiffness really enhance this shoes performance in races whilst the cushioning is suitable for a wide range of running making this shoe versatile and great bang for you buck. The big question: Would I lay down my hard-earned cash for it? Yes definitely. No worries Cooba. They are a great shoe, let us know how you go in them. i presume if these are a performance/race shoe they are a neutral shoe? i am a slight underpronator with a high arch. i am looking for a shoe to train (and eventually race) in, up to half marathon distance and probably beyond (we all have to start somewhere!! 🙂 )…. looking to get under 1’30” on the half, and currently running about 25-30 miles/week. i recently bought some adidas marathon 10s, but am finding the level of stability/cushioning slightly inadequate over the longer runs…. would you recommend the adios 2 for me? if not, is there anything else you recommend? i find internet reviews to be a bit woolly at the best of times, they seem to contain more spec and jargon than simple advice on what kind of runner a shoe suits! you seem to know what you’re talking about though… help! I don’t have a perfect foot strike either and find this shoe is good in terms of cushioning. but that being said I have been running in much more minimal shoes for some time now and have adapted. In my opion this shoe should be fine for most people up to 21km for racing (unless you are a heaiver set bloke, in which case you might need somthing bigger). That’s a pretty big generalization thou. If in doubt mate or experiencing pain in longer distances i would seek advice from a physio.